Kreuz Market and Smitty's are closely related. 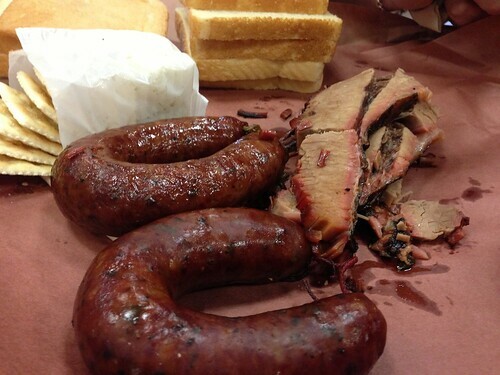 Smitty's location is the original location of Kreuz Market. But when the patriarch of the Schmidt family died, his son Rick Schmidt owned the business, but his daughter Nina inherited the building, and Nina's terms for rent were unacceptable to Rick. 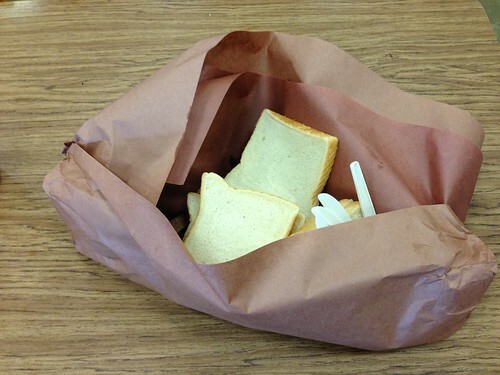 (My source for this is an interview with Rick at http://southernbbqtrail.southernfoodways.org/texas/kreuz-market.shtml . Rick said very clearly that there was no feud between him and Nina, but I suspect that there were at least a few stern looks.) So Rick moved Kreuz Market to a big new building north of town, and Nina established Smitty's in the old building. The biggest difference between the buildings is that Kreuz Market looks like a building that was crafted as a barbecue parlor, but Smitty's looks like a place that "just happened". I've experienced a handful of other restaurants with that uncrafted quality - and a slew of restaurants that try to imitate it. For example, T.G.I. Friday's and a bunch of other chain restaurants try to imitate the "junk on the walls" quality of a place like Chiodo's - but the junk on the walls at Friday's feels deliberately chosen and placed, whereas no curator's hand ever guided the selection of the brassieres thrown to the ceiling at Chiodo's. Another example: there is a company named The Irish Pub Company that specializes in the design and manufacture of Irish pubs around the world. I'm sure they have done their homework, they know what makes an Irish pub work, and they try to create an Irish pub experience as authentically as possible - but I've been to several Irish pubs in the US that felt like I could turn them over and see a "made by the Irish Pub Company" stamp on the bottom. And in the same way, Kreuz Market's building looks like what you would get if you contacted the hypothetical Genuine Texas Barbecue Joint Company and said, "I'd like the extra-large economy size, please." There's no doubt that the creators knew exactly what sort of place they were recreating, and I would not say that Kreuz's is not authentic. 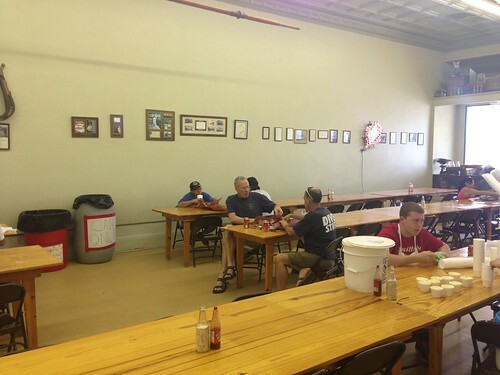 But Kreuz's tables have never had knives chained to them in lieu of other cutlery. 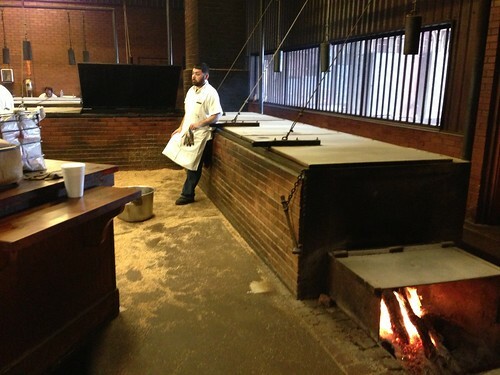 Kreuz's walls have not accumulated the geologic layers of carbon that Smitty's has acquired from decades of smoking. And the sign in Kreuz Market that said "No forks - they are at the end of your arm" seems to me to be a sign of a restaurant that is explaining itself to tourists instead of catering to locals who know how it works. This isn't a bad thing in itself, but it is a crafted thing, and I tend to prefer uncrafted places simply because those are harder to find. I'm presenting photos out of strict chronological order in order to compare and contrast Kreuz Market and Smitty's. Should chronology matter, we visited Kreuz Market and then Smitty's. Kreuz Market is a big barn of a building by the highway - I've read that it seats 560 people, though people inside said that it only gets anywhere close to full on Friday and Saturday nights. Smitty's looks like a storefront on the town square from one side, but it's more prominent on the side facing the highway. 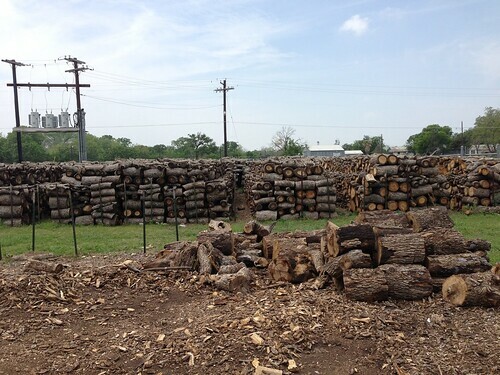 The first thing we saw at Kreuz Market was actually the woodpile. We were very impressed by the sheer size of the woodpile - it's clearly designed to support a massive amount of smoking. Because of that, we made sure to see the woodpile at Smitty's before we left. It also shows a dedication to smoking, but it doesn't have the immense scale of Kreuz's. 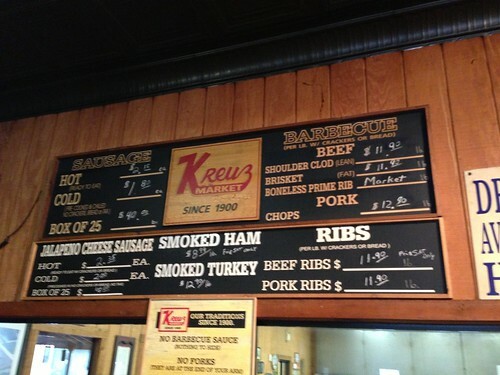 The menu board at Kreuz market. (I don't have a photo of a menu board at Smitty's, and I don't remember seeing one.) The name "shoulder clod" is very low on the list of fancy names for a cut of beef. At Smitty's, years of smoke have deposited carbon on the walls above the smokers in formations that resemble the walls of a cave. But what about the barbecue itself? And this is what it looked like unveiled. The brisket (my notes say brisket, but perhaps this was the shoulder clod) was very smoky, but somewhat dry. The sausage, though, was lovely, with a robust flavor and a firm snap. Of all the sausage we had on this trip, this came closest to epitomizing what I think of as a Texas hot gut. 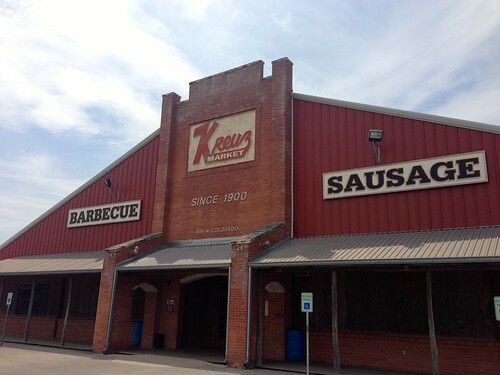 Kreuz Market has expanded to include some side dishes as well, and we sampled their beans. 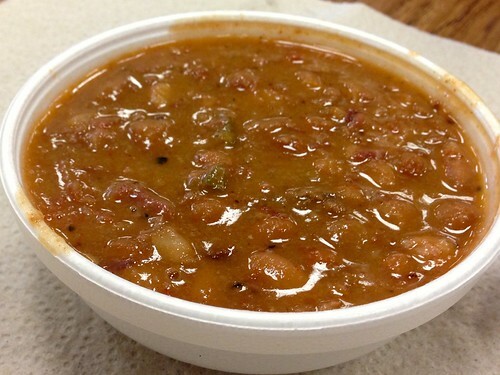 The beans had a lot of spice and sausage bits, and it added up to a great flavor. This is our order from Smitty's. The brisket was paler but had a more vivid smoke ring than from Kreuz Market. It had a peppery crust and was a little juicier than Smitty's, though still on the dry side. The sausage at Smitty's edged across the line from "juicy" to "greasy", but it too had a lot of flavor. 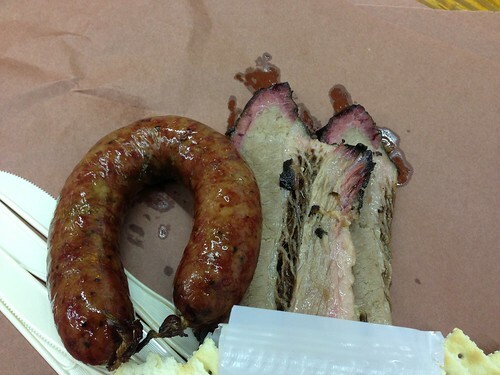 I should emphasize, though, that both of these briskets and sausages were very similar and very good. I look for differences because that's a way to draw out the individual character of each place, but I'm not at all sure I could distinguish them in a blind tasting, and I'd be more than happy to eat either one. And I do not know whether the differences I noted, if they're real, were due to the restaurant or to variations between different cows.